JEFFERSONVILLE, Vt. - The bustle of Vermont's famous Stowe area has not yet spilled over the mountains into the Lamoille River Valley - nor have the crowds. Here await quiet rambles filled with . . . well, I may as well say it: spacious skies, amber waves of grain, and purple mountains' majesty. Hokey? You bet. But it's the kind of hokey you will want to take home in the form of an award-winning bottle of wine coaxed from local grapes, cranberries, or blueberries. Or as a set of buffalo-checkered woolies just like the locals have been wearing for the past two centuries. Or a painting that those who haven't been here would call idealized (but you'd know better). The Lamoille River itself pours out of the Green Mountains, destined for Lake Champlain. On its way, it moseys, bucks, and tumbles through farmland, wee towns, and forests. In Jeffersonville, where it moseys, about 15 of us have come from all over the country - Oklahoma, Pennsylvania, Oregon, Virginia, Maryland - to find the perfect antidote to our harried lives in this languid current, doing nothing for about an hour and a half except to pull along in a tiny armada of canoes and kayaks, our destination a winery set high on the riverbanks. Most of my new companions are staying at nearby B&Bs or at the resort Smugglers' Notch, where adventures, pampering, fabulous food, and frolic - all tucked into a neighborhood of soaring mountains - could easily soak up every minute of vacation without one ever needing to venture beyond its boundaries. I have opted for a quiet log cabin at Sterling Ridge Resort in Jeffersonville, where the night is so dark that I could watch the stars undulate in the 10-acre pond next to me. But we have miles to go (4 1/2 to be exact) before we retire to our respective hideaways. In the meantime, our guide keeps an eye on his flock of newbie and seasoned paddlers. The occupants of one canoe, a family from New Jersey, twirl their way downriver, enjoying the freedom and high humor served up with complete lack of control in a lazy current. By the end of the voyage, when their canoe swings this way and that, it's as much due to newfound paddling prowess as it is to the whim of the river. Just in time for the wine tasting. At Boyden Valley Winery, our crisply casual winery tour guide makes us forget our collective rumpled and sweaty condition as he ushers us though the atmospheric, circa 1875 post-and-beam carriage barn that houses the winery, and doles out samples in miniature wine glasses. For a century the Boyden family has been coaxing lively whites and medium-bodied reds from their 8,000 vines and from black currants, blueberries, rhubarb, apple, cranberries, and maple syrup from the nearby mountains and river valley. A special harvest of grapes, left on the vine until after the first long, hard frost in December, yields a sublimely contradictory ice wine: delicate yet intense, crystalline yet velvety, quietly dazzling first the palette, then the fingertips. Only slightly tipsy from the wine tasting, we arrive, peckish, back at the canoe livery. Next-door Cupboard Delicatessen & Bakery offers more than 100 wraps (15 to 20 ready and waiting at any given time) for those laying in provisions for their next ramble. It's too late in the day for the Bitchin' Breakfast Bomb, so perhaps something along the lines of the chicken Florentine, pizza, or chipotle wraps - depending, of course, on what goes best with the top choice from among about 15 types of cookies. We're too late for a chance at one of their 16 fresh doughnuts, crispy or cakey, picked off bright and early by those in the know. One of the best places for a drive to burn off a late lunch can be found near the crest of Smugglers' Notch on the famous Route 108 that runs over the mountains and into Stowe. The road squeezes through outcroppings, beneath overhangs, and around enormous boulders hewn from mountains that crowd in from either side. Turns are crimped tighter than a twist-tie on the Stowe side, rendering it impassible to large vehicles, particularly motor coaches, motor homes, and commercial vehicles. Near the crest, you can leave your car behind and wiggle into caves where armaments and even cattle were stashed on the smugglers' route to Canada, where they were sold to the British during the War of 1812, and later where liquor was spirited away on its southerly course from Canada during Prohibition. On the opposite side of the road, an hour's hike leads to quiet, pine-shrouded Sterling Pond, along which the legendary Long Trail runs. A lean-to on the far shore houses exhausted backpackers who take on the trail, which traces the spine of the Green Mountains on its tip-to-tail journey along the entire length of the state. By now you'll have changed tomorrow's plans a dozen times as locals willingly reveal their favorite drives, hikes, galleries, eateries, and the like. Back in the valley, myriad studios and galleries attest to its enduring allure to artists, who have flocked to the area for generations to capture the "golden corridor," the human and natural landscape that is draped between Johnson and Jeffersonville and drenched in timelessness. They came, they set up studios, and they painted up a storm. 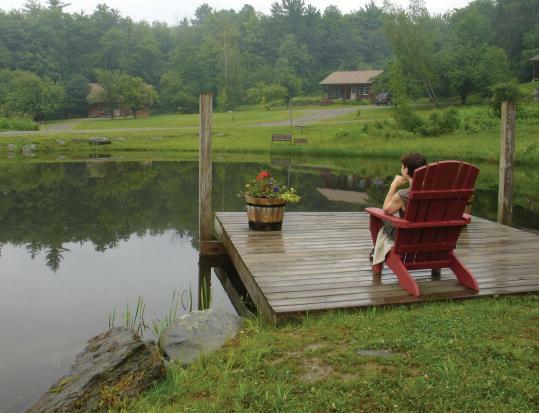 Vermont Studio Center in Johnson is the largest artists' and writers' residency program in the United States, founded nearly 30 years ago by artists. The 30-building campus hosts regular gallery shows, readings, and lectures open to the public. Getting lost in the landscapes at Jeffersonville's Bryan Memorial and Visions of Vermont galleries, both on Main Street, is pure heaven. Nineteenth-century farmers, who originally built the picturesque barns that now sag dreamily into wildflower fields, brought their raw wool to Johnson Woolen Mills. Since 1845, the company has woven that wool into the buffalo-checked "jac" shirts and iceman's pants that have, in turn, enabled generations of farmers to stave off the cold in a climate that turns sharply unforgiving in winter. The factory store is located next door to the factory, an anomaly in this era of manufactured "factory" outlets. You'll thank those wool-clad farmers as the sun slides behind the mountains and chilly air drops in. Pull on that jac shirt, warm yourself from the inside with something from the Boyden Valley Winery, and settle in for a stretch of porch time - yet another dyed-in-the-wool Vermont tradition. Clare Innes can be reached at indigoclare@yahoo.com. Log structures with the right balance of rustic ambience and modern convenience. Rates vary by season. May 23-Sept. 25 and Oct. 13-29, $135-$440 (two-night minimum). Water & Wine Canoe Tour: $35 per person, noon-3, 1 1/2-2 hours, 4 1/2 miles. Mountains of adventure, children's programs, and fun for all. Five "communities" of accommodations to choose from. Rates vary by season. For a family of four, rates start at $449 per night through Aug. 31, $235 Sept. 1-Oct. 12. Offers a variety of tours, including morning river tours, an "ice cream float," and wildlife watch. Kayaks and canoes available; $40-$75 per boat. One hundred years of award-winning wines. Tours free; tasting $5. Wines run $15-$65. Artist residency programs, public events year-round. Bright and airy, embracing fine landscape artists and nurturing aspirants. Daily 10 a.m.-5 p.m., through October. Landscapes galore in a lovingly restored carriage barn and home. Features the work of Eric Tobin. Tuesday-Sunday 10 a.m.-4 p.m.
Everything you need to stay warm and dry: piles of colorful woolens woven in the small factory next door. Monday-Saturday 9 a.m.- 5 p.m., Sunday 10-4. A local favorite for every meal. Breakfast $3.18-$9.58; lunch $4.98-$13.98; dinner $8.58-$21.95. Tuesday-Saturday 7:30 a.m.-3 p.m. and 5-9 p.m., Sunday 8-2. The place where locals load up on essentials, including 100 different wraps, 15 types of cookies, and 16 doughnut flavors. Monday-Friday 4:30 a.m.-10 p.m., Saturday and Sunday 5-10.